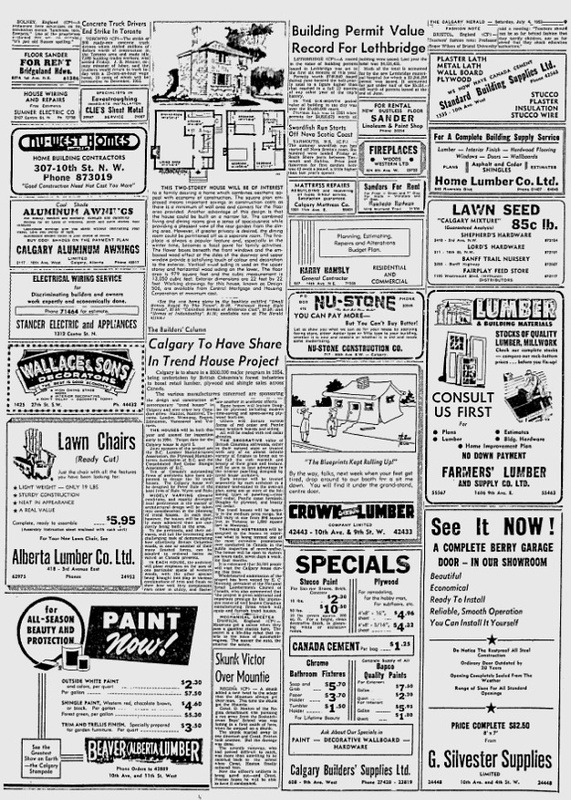 Calgary is to share in a $500,000 major program in 1954, being undertaken by British Columbia’s Forest industries to boost retail lumber, plywood and shingles sales across Canada. 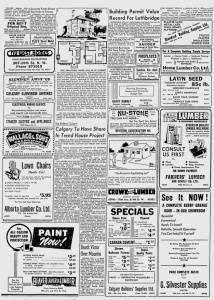 The houses will be built this year and open for inspection early in 1954 target date for the Calgary house is April 5. Joint sponsors of the project are the BC Lumber Manufacturers Association, the Plywood Manufacturers Association of BC, and the Consolidated Red Cedar Shingle Association of BC. 10 of Canada’s outstanding firms of architects have been appointed to design the 10 trend houses. The Calgary house will be designed by Peter Rule of the local firm of Rule, Wynn &Rule. Widely varying climactic conditions, and equally divergent local preferences in the matter of architectural design will be taken into consideration in the planning of trend houses. In each case however, the houses will be slightly more advanced then are currently being built in the area. To the architects, and their advisers, will fall the interesting and challenging task of demonstrating how effectively British Colombia woods, in one or another of their many finished forms, can be adapted to regional taste as varied as Canada presents. In each house, the architect will place emphasis on the uses of one particular species of Western woods, with the other species being brought into play in various combinations of trim and finish to show how well they complement each other in utility, and flatter one another in aesthetic effects. Some houses will feature Douglas for plywood including modern time saving and space-saving plywood built-ins. Others will feature various forms of Red Cedar and Pacific Coast Hemlock boards and siding. All will be roofed with Red Cedar shingles. The decorative value of British Columbia softwoods, either in their natural state or treated with any of an almost infinite variety of finishes to bring out the full rich warmth and the beauty of their grade and texture, will be seen to best advantage in the interior paddling designed by trend house architects. Each interior will be treated separately by each architect in a manner best suited to the overall plan, using one or more of the following types of paneling – clear rRed Cedar, Pacific Coast Hemlock, Douglas Fir plywood, and knotty Red Cedar. The trend houses will be largely in the medium price range, but will vary in size from 800 ft.² in Victoria to 1800 ft.² in Montreal. Trained hostesses will be assigned to the houses to supervise what is being termed one of the most extensive promotions ever conducted in Canada in the public inspection of merchandise.The houses will be open to visitors six hours daily, seven days a week, for four months. It is estimated that 30,000 people will visit the Calgary house during this time.